Renting a villa in Greece through Dolphin Hellas enables you to enjoy your holidays in Greece in complete privacy without having to compromise in what concerns to the amenities that a hotel can offer. In the following pages you will find a range of individual island properties in Greece, in the Ionian and Aegean seas (more specifically on the Ionian and Sporades islands and on Crete). The choice is wide: a mountain-top retreat, a simple studio or town house close to the waterfront, a country cottage in the olive groves, a luxurious villa with magnificent views and its own direct access to a sandy beach, or a comfortable home with a pool. For those clients who may not wish to spend every day relaxing on secluded beaches, we can offer boat hire for coastal exploration. Car hire is highly recommended in some cases and is accordingly designated. Maid service is included for all villas in the Sporades & Ionion. Paxos, the smallest of the Ionian islands, is seven miles long and three miles wide and lies ten miles south of Corfu. About half of the island’s population of 2,500 live in the three villages of Gaios, Loggos and Lakka. There is a delightful contrast of colours in the narrow, flagstoned streets of Paxos: whitewashed walls; pastel coloured shutters; multi-coloured café bar sun umbrellas; crimson and purple bougainvillaea; passion flower vines; oleander trees; potted plants on Venetian balconies and shop displays of fresh fruit. The island resembles one vast garden thickly covered with olives planted by the Venetians over three hundred years ago and tall pine trees, which together descend to over 30 sheltered beaches on the east coast and the dramatic cliffs of the west coast. In the hills bracken and wild flowers, lilies, cyclamen and crocuses abound. The sea is crystal clear and clean. Views from Paxos of Corfu, the mainland of Greece nine miles away and along the island of Paxos itself, are outstanding. AntiPaxos, the little vineyard island just one mile off the tip of Paxos, has only 30 inhabitants and some of the loveliest sandy beaches in the Mediterranean. For those who like exploring by boat or on foot, there are on Paxos and AntiPaxos grottoes, caves, tiny unpopulated islands, uninhabited villages, ancient fortresses. A visit to the mainland village of Parga allows one to be taken up the ancient River Styx by a local fisherman. South across the sea about one mile from Paxos lies the tiny island of AntiPaxos, just four kilometres long and two kilometres wide. The island is owned in individual plots by Paxiot families and although there are very few houses here, those families who have built a small home on AntiPaxos come here for their holidays and to cultivate grapes. An undulating interior of hillsides, carpeted by maquis, contains small vineyards above beaches of sand and pebble. A network of narrow tracks lead from the small harbour of Agrapidia up to the interior and past the occasional cottage with gardens of fruit trees, vegetables and vineyards. The local grape produces a rich, red and unique wine. Pathways, bordered by large bulbs of sea squill and wild herbs, lead down on the east coast to the sandy bays of Voutoumi and Vrika with their chalk-blue, crystal-clear waters. The tiny neighbouring island of Daskalia has a secluded beach with stunning views of the mountains of Lefkas. The peaceful population consists of about thirty people. There exists a rare feeling of absolute peace and quiet. Hospitality takes on a different meaning; as a small but intimate and friendly community there is always a bowl of sugar to be borrowed. AntiPaxos will appeal to couples looking for an unusual escape from even the smallest of crowds. The two tavernas overlooking Voutoumi beach will usually remain open at night on request from June to September. There are four tavernas but no shops on AntiPaxos. We recommend that we arrange a substantial hamper of provisions for your arrival. Clients can contact our Paxos office to order further supplies, which will be delivered the next day. From the end of May an "Express Boat" travels between Paxos and two of the AntiPaxos sandy beaches. The journey takes twenty minutes. The island is small but distances are deceptive and in parts the tracks are steep and uneven: good walking shoes are recommended. Ithaca, the island of Odysseus and Homer’s Odyssey, is only a few miles from Cephalonia. Probably the most legendary of all Greek islands, Ithaca is strangely one of the least known. Many visitors have come close by sea but few have stayed in one of the tiny fishing villages and felt the charm of a beautiful island still unspoilt by tourism. Ithaca is a deceivingly large island with a population of just three thousand and will appeal to those looking for a relaxed and friendly atmosphere, clear waters and an escape from built-up resorts. The crop of olives constitutes the main economy. The atmosphere in the clear water harbours of Kioni and Frikes is simple, lazy and welcoming. A winding road leads from the capital port of Vathy to the smaller ports of Polis, Frikes and Kioni, skirts Mount Niritos, allows a quick glimpse up to the village of Exoghi, perched up high overlooking the Bay of Afales, and passes the beautiful beaches of Agios Yannis. Exploring this unspoilt island by boat or on foot, you are able to discover the legendary places mentioned in Homer’s Odyssey, small inland villages, ancient monasteries and deserted beaches. Kioni and Frikes are attractive bases from which to explore the island. A narrow, twisting road leads to the natural spring of Kalamos, whose cool waters spill away to irrigate terraces of tangerines, melons and loquats. From Kalamos there are spectacular views across the dark, blue bay of Afales towards Sappho’s Leap on Lefkas. Cephalonia, the island of honey and wine, lies opposite the mouth of the Gulf of Corinth just sixty miles south of Paxos. Many of the island’s south coast beaches are of fine golden sand which shelve gently under sparkling water making them ideal for children. Other beaches on the island are shingle and are good for snorkellling. For the explorer, Cephalonia offers many ancient sites of unrivalled beauty. Venetian fortresses and monasteries; Byzantine churches containing their sixteenth century icons still in their original bright colours; underground Mycenaean tombs dating back to 1200 BC; the remains of a Roman villa which houses four fascinating mosaics dating back to the second century AD; serene lakes surrounded by proud cypress trees; large caves encrusted with stalactites; and a host of small fishing villages and secluded coves. Mount Aenos, in the centre of the island, higher than any mountain in the British Isles, looks down through thick pine forests to a luxuriant landscape of olive, cypress, orange, lemon, grape, corn and wild lavender. Watersports facilities are available on the sandy beach of Makris Yalos. The many tavernas on Cephalonia serve an extensive range of delicious dishes which are exclusive to the island; the local Calliga, Metaxa and Manzevino wines are delightfully crisp. There are many faces to the island of Corfu. In some parts the coastal resorts provide well organised holiday activities for all visitors. In other parts, Corfu retains a sense of cultural and environmental pride. Deep green valleys of olive terraces and tall cypress trees enclose small hamlets of pastel coloured houses, whitewashed churches, simple tavernas with rickety chairs under grapevine, farmland and groves of orange, fig and wild pear. Beaches, large and small, of sand or pebble indent the coastlines and offer safe swimming in clear waters. Lake Korission on the south west coast provides a haven for birdlife. Corfu is still one of the most beautiful islands in Greece. All too often, however, to stay close to a beach on Corfu means sharing a location with the high season crowds. The here presented villas are situated in beautiful and secluded locations to ensure privacy and distance from the more commercial resorts. They will not appeal to those wishing to stay in the heart of a small, Greek island fishing village, but will offer the more sophisticated trappings for peaceful relaxation. Corfu Old Town is a delightful maze of eighteenth century, cobbled shopping streets and hidden squares behind tall Venetian houses with flaking pastel plaster. A 16th century fortress looks out over the port towards the Greek mainland and down to the old town of Corfu. The town has preserved the fine architecture of Venetian, French and English occupation; a stroll through the maze of narrow streets will enamour both the historian and the romantic sightseer. The island’s undulating interior contains a contrast of rich valleys, small villages atop distant knolls, dramatic views of Albania from Mount Pandokrator and a wealth of interesting walks. One day or three day excursions to Albania from Corfu Town can be arranged. Corfu offers varied nightlife and cuisine, boat hire to find secluded beaches, watersports, an excellent 18 hole golf course and an opportunity to explore an island of diverse beauty. Lefkas is blessed by Nature – the grand mountain spine of Mt. 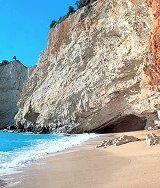 Stavrotas, the dramatic west coast cliffs with their fine sandy beaches, the sheltered eastern waters surrounding nearby isles and the mountains of Acarnania on the Greek mainland closeby. 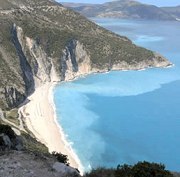 Lefkas, the fourth largest of the Ionian islands is named after its white ("lefki") cliffs. The island is twenty-one miles long and nine miles wide and was joined to the Greek mainland by a long narrow isthmus until the Corinthians excavated a canal in 640 BC. Today an efficient swing-bridge operates across the canal. Most of the island’s tourism centres on the seaside town of Nidri, half way down the east coast. In evident contrast to the smaller and more attractive fishing villages such as Vasiliki, Sivota, Ligia and Agios Nikitas, Nidri is a cosmopolitan resort with discothèques, boutiques and tavernas. Lefkas Town is surrounded on three sides by calm, shallow waters which have, in recent years, made it an ideal haven in which yachts can moor, dry-dock and make repairs. 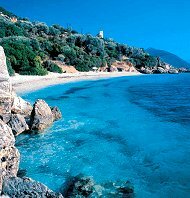 The east coast of Lefkas is indented by both small and large beaches of sand and shingle and is best explored by private boat. In contrast to the busier east coast, a short drive up to the interior mountain range takes one to the beautiful villages of Karia, Pigadisani, Tsoukoulades, Vafkeri and others, hidden away on forested hilltops with dramatic views across an undulating landscape. Many of the island’s wide fertile valleys, which are clad in olive groves, vineyards and cypress trees, hold only one or two farmhouses. Cottage industries of tapestry, lacemaking, ceramics, nougat and honey are evident within the mountain villages, where life centres around the cafés of the square, shaded by large plane trees. Lefkas hosts an international Festival of Art and Literature during August; folk dance, drama and singing flows out of the halls into the town’s narrow streets. The island boasts fine cuisine and local delicacies. A varied selection of small and large tavernas serve an enticing assortment of dishes to appeal to all tastes and most tavernas offer a wide variety of fresh fish. Regular boat trips leave Nidri to visit the nearby islands of Madouri, Meganissi and Skorpios, now owned by Onassis’ grand-daughter Athena. Ferries to Cephalonia and Ithaca run daily throughout the summer. The island of Alonissos is thirteen miles long and three miles wide and, like her neighbours Skopelos and Skiathos, her hillsides are covered in thick pine forests and olive groves. Immediately opposite the east coast of Alonissos is the island of Peristera which is home to a few shepherds. A short trip by caïque to the north are the islands of Kyra Panagia and her isolated monastery, Gioura, and Piperi which form the Northern Sporades National Marine Park – this was founded in 1992 for the protection of the monk seal and several rare species of bird. The seas in the area are rich in marine life and if you are lucky, dolphins will accompany you on your trip. All the islands are uninhabited except for colonies of wild goats – Gioura possesses a spectacular cave which is believed to have been the home of the Cyclops. The fishing port of Patitiri is a colourful jostle of large and small caïques supplying the island and the mainland with a rich assortment of fish. Taking a private boat from Patitiri and travelling along the south-eastern coastline, one passes the small fishing village of Votsi; secluded coves backed by wooded hillsides; the sheltered harbour of Steni Vala with its sleepy, waterfront tavernas specialising in rich soups of scorpion fish and mullet; the neighbouring island of Peristera, carpeted with wild olive trees and indented by small bays; the seaside hamlet of Kalamakia, consisting of three family homes each with their own taverna above a jetty; a further stretch of secluded beaches culminating in a cluster of deep sea caves studded by stalactites. Alonissos is an island of contrasts: a rich green interior of pine forest and olive grove, the varied shades of blue Aegean Sea; small, secluded beaches and deep sea-caves carved out of steep cliff faces; the port of Patitiri, busy with its fleet of fishing boats and visiting yachts, and the unhurried atmosphere of the old town. Skopelos is the largest of the Sporades islands and lies between Skiathos and Alonissos. The hydrofoil from Skiathos takes 45 minutes to reach Skopelos. A drive or walk through the pine forested interior will lead one to valleys of plain trees, which thrive on the abundant spring water; hillsides of umbrella pines hiding small churches and white-washed monasteries; rough tracks lined with wild fruit trees; terraces of olive, walnut, almond, plum, pear, grapevines and citrus; cliff top tracks used by large, shaggy goats and surveyed by birds of prey, and a multitude of vantage points to enjoy dramatic views across the Aegean Sea to neighbouring islands. The coastline, best explored by private boat, contains small, deserted beaches flanked by rock and pine trees. There are over 360 churches on the island, many of which are Byzantine. The monasteries on the hilltops behind Skopelos Town are inhabited and looked after by a small number of aged nuns who welcome visitors with a gift of sweet "loukoumi". Fishing trips are readily arranged to try one’s hand with line or net. Different walks each day will take one to forested valleys akin to a Norwegian landscape, hidden springs which feed fruit and nut groves, dramatic vantage points - such as the shrine to the island’s saint who was said to have slain the dragon who devoured the ancient population of Skopelos and whose spirit rests at the bottom of the impressive Dragon Cliffs (Drakontoschisma)- uncharted tracks which lead to the forgotten remains of deserted villages, the colourful assembly of whitewashed houses which surround the fortress on top of Skopelos Old Town and fight for position down the hillside of cobblestoned streets. To relax in between explorations of the island’s history and geography, the attractive villages of Agnondas, Panormos and Glossa provide peaceful resting points to sample local delicacies of food and drink. Skiathos is the smallest of the Sporades islands (eight miles long and six miles wide) and lies closest to the Greek mainland, six miles away. The northern coastline remains virtually untouched; a visit to the northern beaches, below beautiful valleys of pines, by private boat will reward the more adventurous with clear waters and privacy. 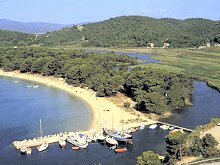 Alternatively, the tiny island of Tsougria off the southern coast can be reached by caïque in fifteen minutes from Skiathos harbour and offers a selection of sandy beaches. Skiathos Town is the only town on the island; most of the island’s population of about 5,000 live here. A busy high street of shops and bars opens out onto a waterfront which flanks two sides of the town. The old town of Skiathos, on the hilltop above the harbour, only dates back to 1830 when the islanders felt safe against pirates to move their capital from the secluded northern cliff tops to its present location. The old town, with its cobblestone streets, whitewashed houses and churches and planted courtyards, offers a peaceful sense of detachment. A drive to the interior of Skiathos allows one to find small hamlets hidden amongst pine forests and ornate churches. Skiathos will appeal to those who want sandy beaches. Small caïques depart every morning from the harbour of Skiathos Town for the more popular beaches. If you hire your own boat with outboard engine, however, you will have a private choice of deserted beaches even in the busiest months of July and August. The here presented villas are close to the beaches but offer peace and privacy in their seclusion away from the busier resorts. Largest of the Greek islands, 160 miles long and up to 38 miles wide, Crete was the cradle of early Mediterranean civilisation and is now an island of unique fascination. Crete's history, geography, mythology and climate has been shaped by the White Mountains ("Lefka Ori") in the west, the Psiloritis massifs in the centre and the Sitia Mountains in the east. The mountains descend to cultivated plains and sleepy villages and then down to a coastline of small fishing villages and sandy beaches. An island rich in contrasts, Crete offers seclusion to the escapist, a sense of discovery to the explorer and varied entertainment for all visitors. Lying further south than Algiers, the little island of Gavdhos, just off Crete’s south coast, is the southernmost point of Europe. It would be difficult to ignore the opportunities to discover at least some of Crete’s unique treasures and renting a car is therefore important, whether to visit the Minoan palace at Knossos, the fascinating old towns of Chania, Rethymnon and Heraklion, the dramatic Gorge of Samaria, the small villages beneath snow-capped mountains or just to find one’s own little beach. The properties that are here presented are close to the northern coastline of Western Crete, and within driving distance of Chania; they are to be found in or close to the villages of Kalives, Kokkino Horio, Vamos, Vrisses and Kambia – all within an hour’s drive of Chania. Chania town is clearly divided between a modern, bustling centre and an intimate atmosphere contained in the old quarter beside the port. The attractive harbourfront, with its colourful assortment of tavernas and bars, leads back through narrow streets lined with old Venetian houses and archways to the busy commercial centre. The town is a beautiful puzzle of Minoan, Venetian and Turkish architecture punctuated by hidden squares. Following the coastal roads east of Chania an undulating countryside of forested valleys hides small villages close to attractive sandy beaches, some with watersports facilities – others just sleepy retreats. This area of Crete offers a slower-paced escape from the built-up resorts and opportunities to discover the island’s history, culture and natural beauty.